I still remember an impromptu trip that happened to me which turned out to be a discovery of food gems. I took Bus 39 home from Tampines Bus Interchange after school and sat at the back. The moment I felt the chilly air-con caressing me, the Z-monster attacked. Before I knew it, I woke up at an ulu place which seemed alien to me – Jalan Kayu Flyover. Bewildered, I took a moment to grasp the situation and my stomach started rumbling. I knew I had to feed my empty tummy. So I whipped out my iPhone and started searching for the nearest civilisation and that was when I chanced upon Jalan Kayu’s hidden charm. Thasevi Food is open 24 hours so you can now add another place to your late-night supper spots list. Plain Prata ($1.10) and Egg Prata ($2) make a standard pairing for me if I can’t decide on what to eat. These wheels of dough are fluffy yet crispy on the outside and goes really well with their savoury and spicy curry. Add some sugar and its grittiness creates an addictive crunch to the prata. 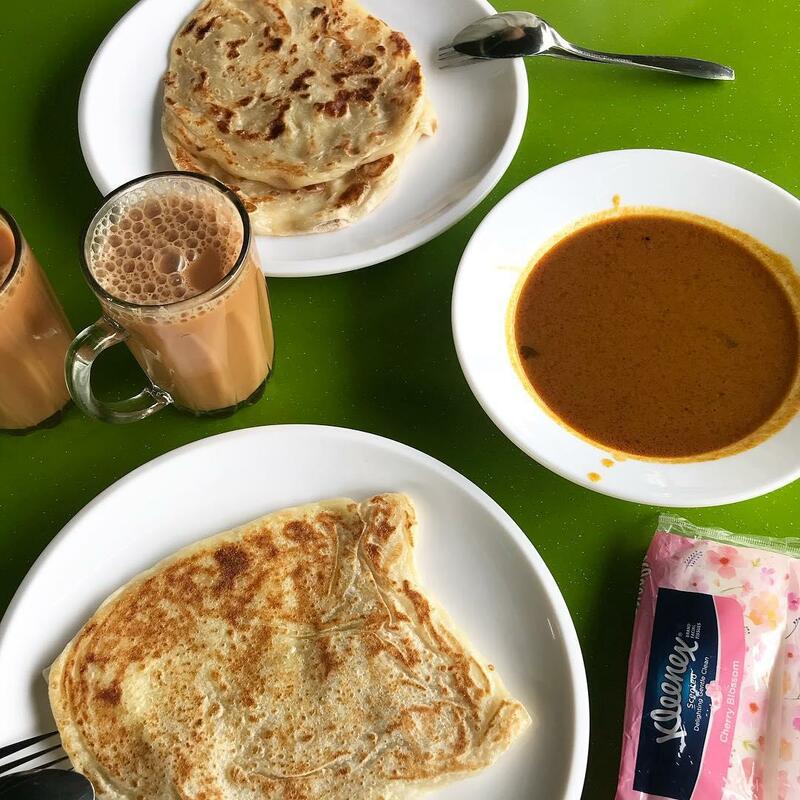 Wash them down with good ol’ teh tarik and you’re good to go. If you’re looking for something to spice up your life with, visit Jerry’s BBQ & Grill. 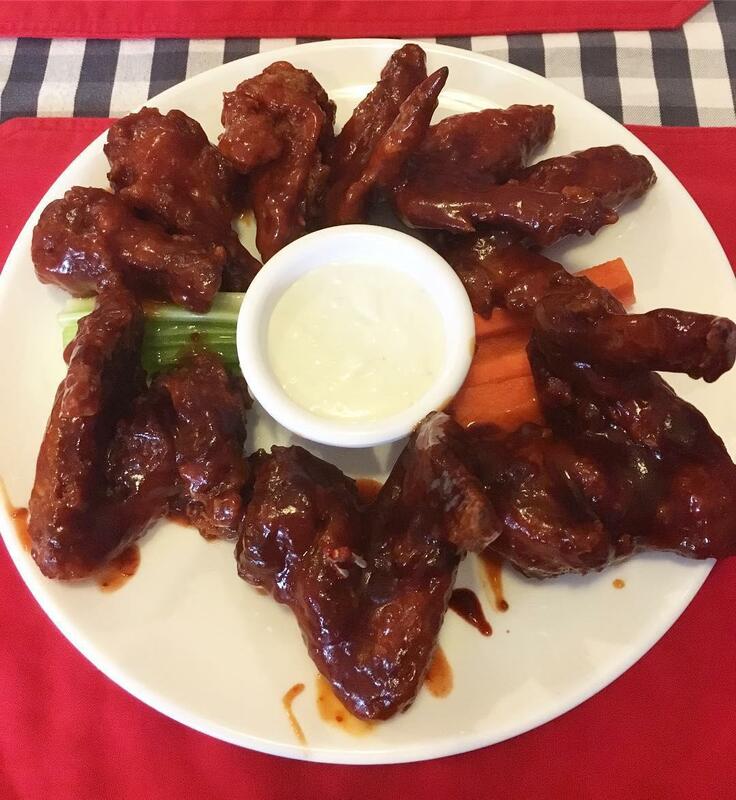 They have Buffalo Wings (from $10.95++ for four pieces) which come in six levels of spiciness. Depending on your tolerance and liking, you can get their Level One Smokin’ or Level Six Jerry’s Insanity 6x. The prices differ depending on the level. They also make a mean Barbecued Beef Brisket Platter ($24.95++), smoke-roasted over hickory wood for at least 14 hours which makes it fork-tender, juicy, and flavoursome. Being one of the longest joints in this area, they sure know what they’re doing. Blanco Prawn Noodle House would be a great place to have your breakfast or lunch at. You might want to come earlier as they close at 4:30pm. 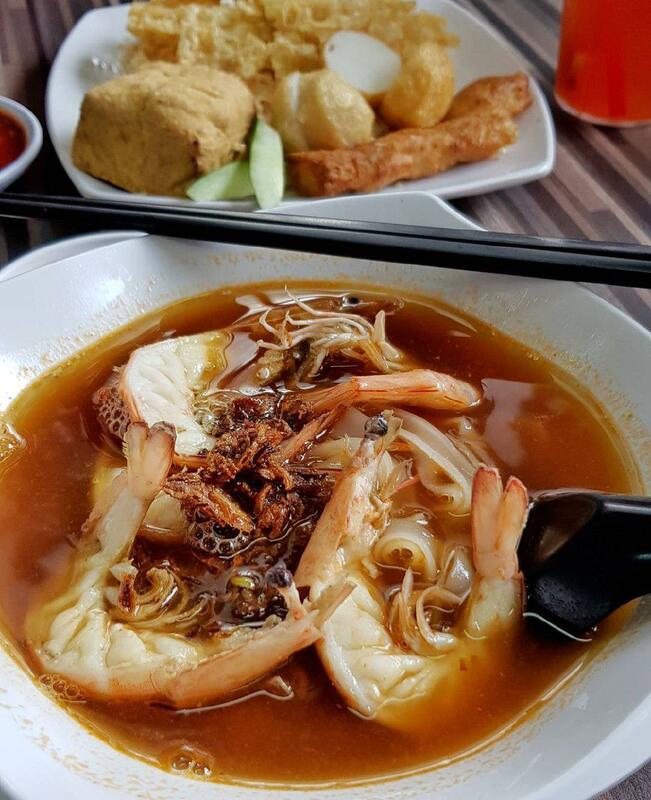 Some have proclaimed their Prawn Noodles ($5.80) to be one of the best prawn noodles they’ve had. Enjoy their plump prawns with egg noodles and rich soup filled with umami flavour. You can choose to have it dry or with soup depending on your preference. It might be a little spicy for you so do opt for no chilli if you can’t handle the heat. 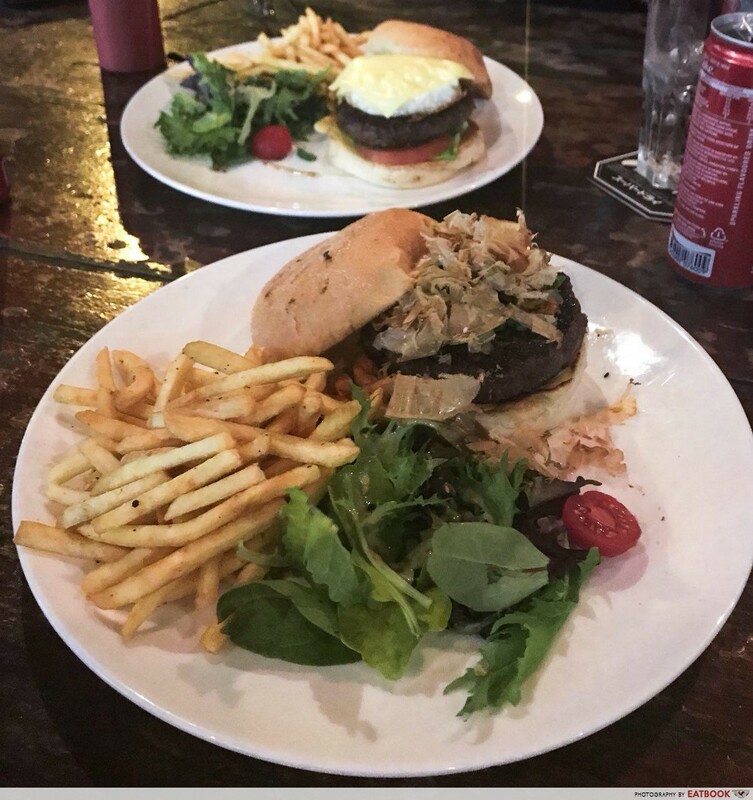 If you’re looking for a bar to chat with your friends over some grub and drinks, One Place Bistro is the place to go to along Jalan Kayu. You can easily spot the bar with their black awning and wooden decor. If you can’t decide on what to get, a safe bet would be their Signature Burger ($27). The burger consists of seared wagyu patty glazed with kabayaki sauce, bonito flakes, kimchi, and scallions. The dish also comes with a side of fries and arugula salad. You can also try their Wild Mushroom & Truffle Oil Spaghetti ($19) or Chicken Kabayaki ($19) if you’re not feeling up for burgers. 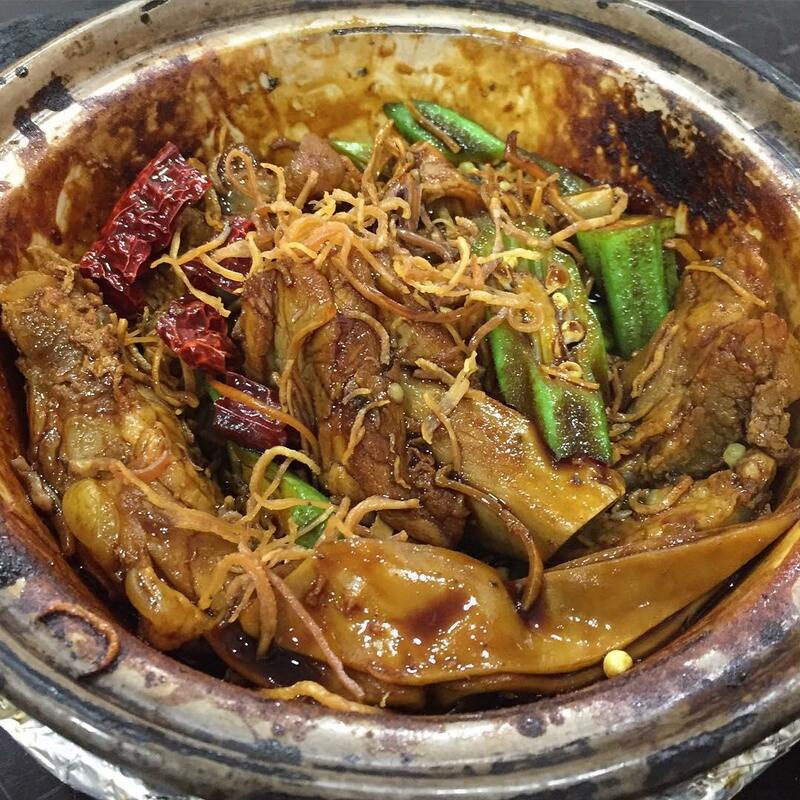 If you’re not in the mood for a heavy meal, Jalan Kayu also has Selegie Soya Bean. Tauhuay is perfect for any time of the day. There is something about bean curd that gives a homely feeling. 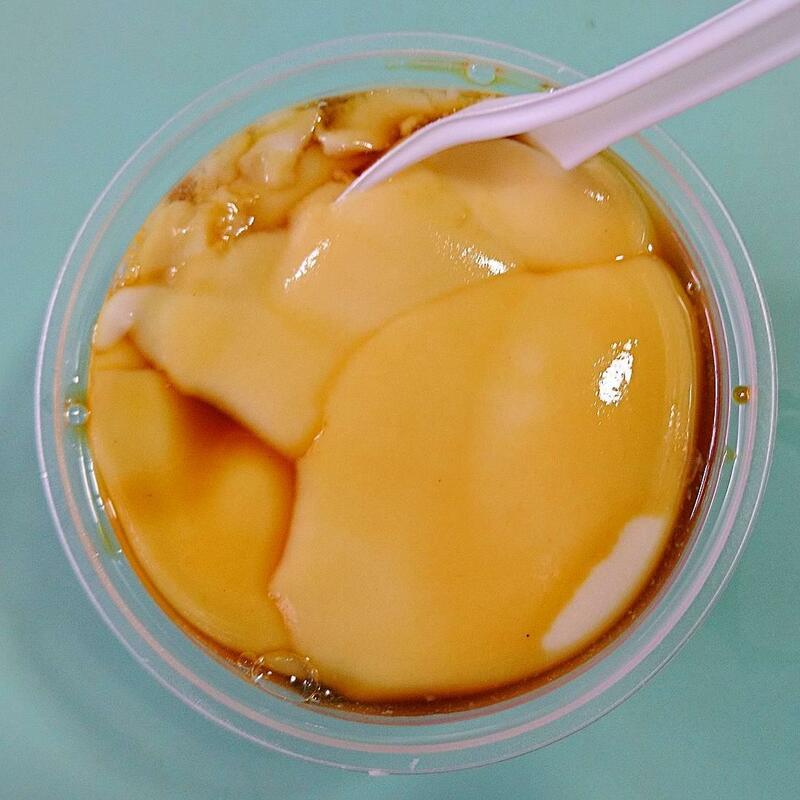 Try their Beancurd with Gula Melaka ($2) – silky and sweet, it slides into your stomach in a comforting manner. If that’s not enough, get a Fried You Tiao ($1) and dip it into your bean curd ‘cause that’s how it is done for those in the know. There are many otak-otak available but people are travelling all the way to Jalan Kayu just to get their hands on a Fish Otah ($0.60) from Hiang Soon Otah Food Catering. 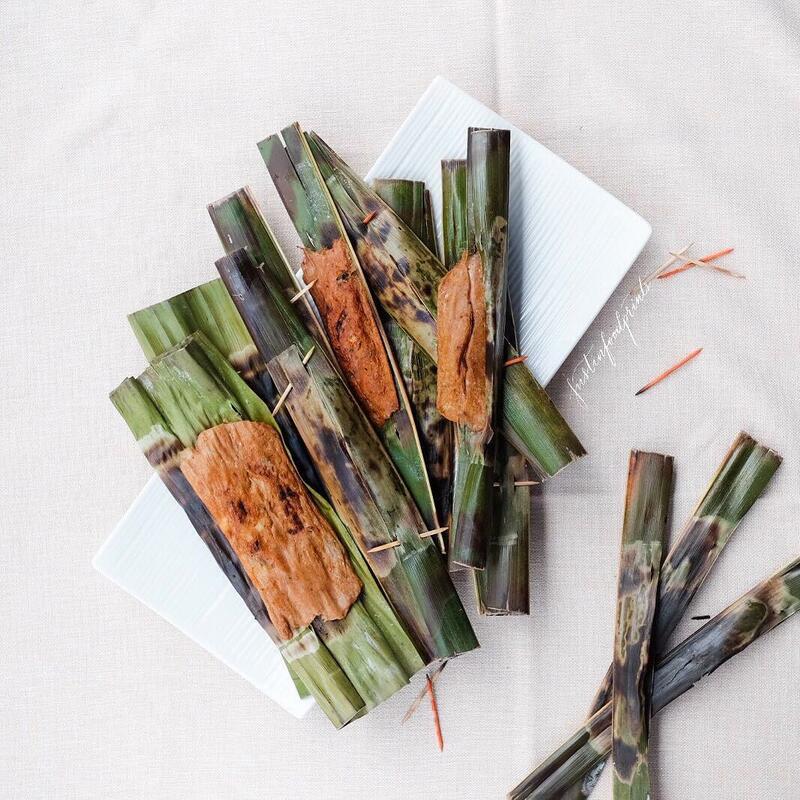 For those who are unfamiliar, they use grounded mackerel meat mixed with spices, stuffed in the slits of coconut leaves and grilled over charcoal. They also have Fish Head Otah ($1) and Banana Leaf Otah ($1.20). The natural sweetness of the mackerel fish and spices combined creates a burst of flavour, that will leave you wanting more. 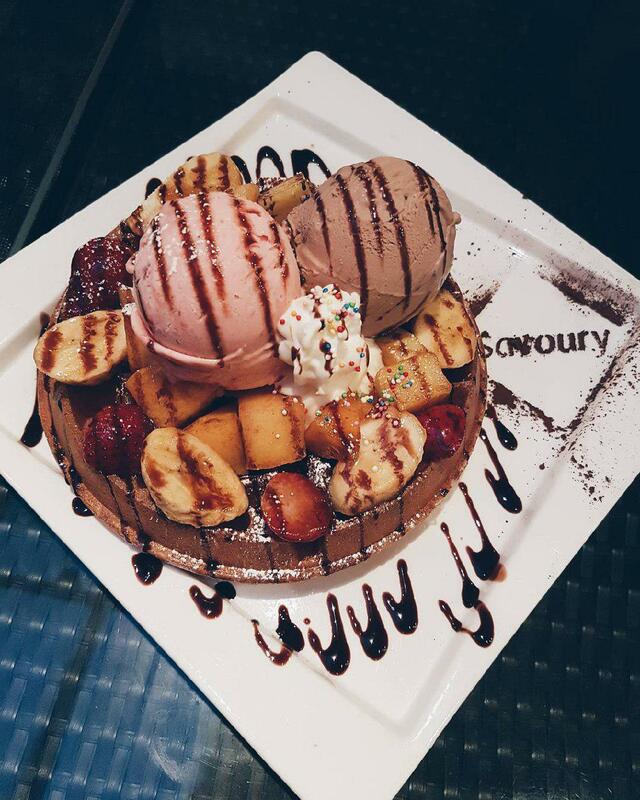 Savoury is a halal-certified bistro nestled along Jalan Kayu. 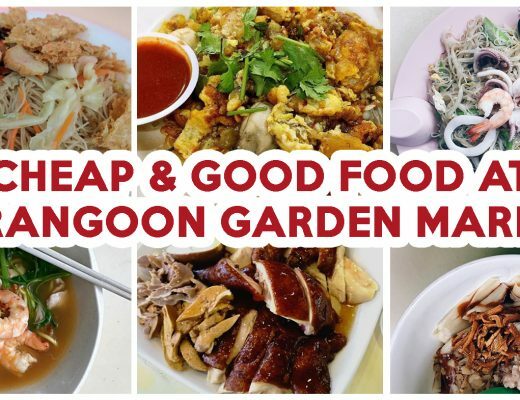 If you’re looking for some great mains and desserts to have, this place is just for you. Signature Waffle ($18.50 with two scoops of gelato) comes with chopped fresh fruits cooked in cinnamon sauce, whipped cream, and drizzled in chocolate sauce. If you’re a durian lover, you might want to give Mao Shan Wang Lava Cake ($14.80 with a scoop of gelato) a shot. Cut it open and you’ll be greeted with durian lava. The hot-and-cold combination is bound to send you straight into a food coma. Lava cake lovers, check out these unique lava cakes as well! 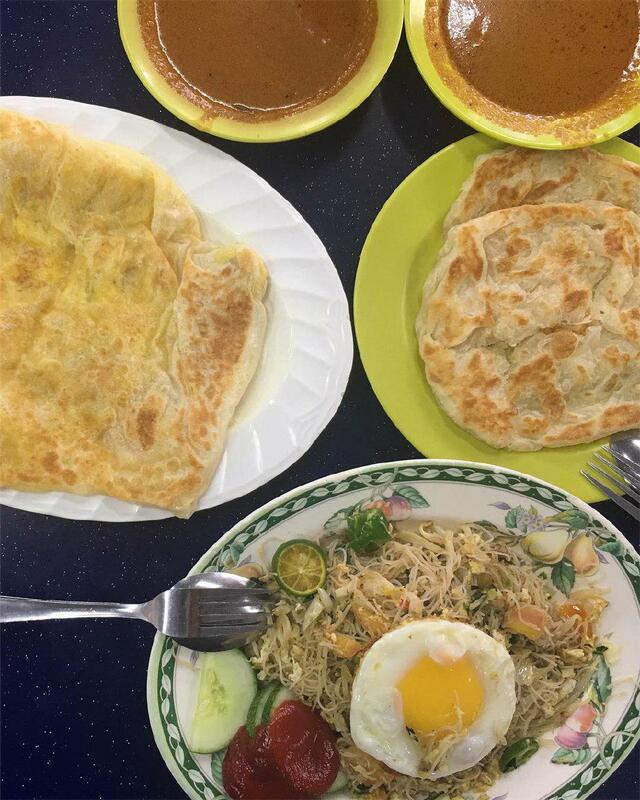 If Thasevi gets crowded, you can still satisfy your prata cravings at Thohirah Restaurant. Get their fluffy yet crispy Plain Prata ($1.50) and Egg Prata ($2.50). Dip the prata into the spicy curry or if you want to do it the OG style, pour the curry onto the prata instead. Their tables are placed right next to the narrow street so you’ll get that rustic vibes while having your meal – you’ll understand when you’re there. Some of you might be familiar with Tang Tea House and yes, there is one here as well. It is one of the few places that sell halal dim sum. I would always get their Golden Sand Bun ($4.80 for three pieces) as it has been consistently good thus far. You can hardly go wrong with a hot and flowy salted egg yolk bun for supper. I love to dip my Siew Mai ($4.20 for three pieces) in their spicy garlic chilli. 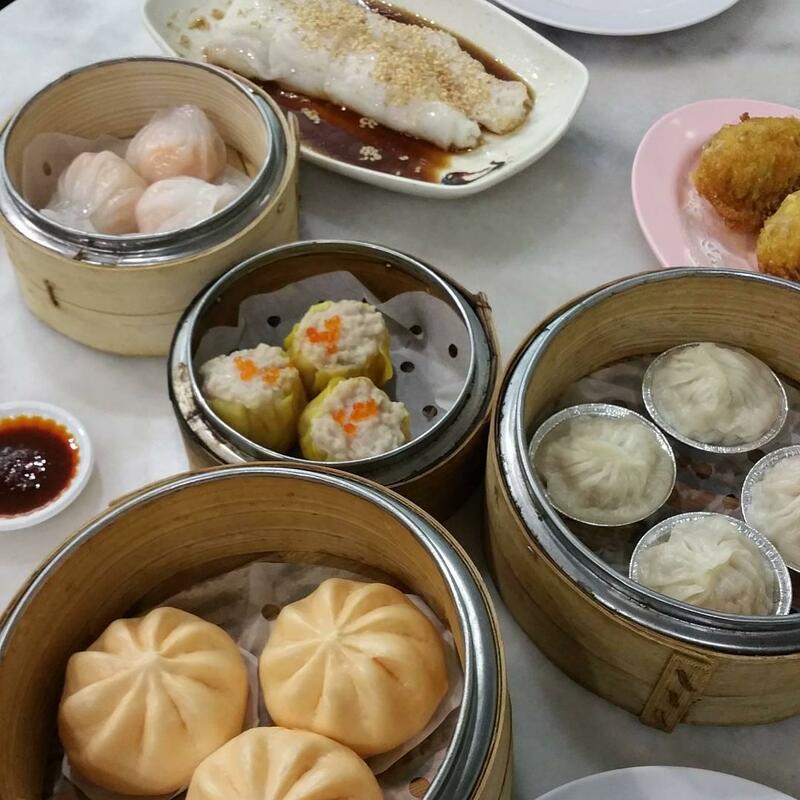 Fret not if you’re not a fan of dim sum as they have rice and noodle dishes as well. Though I have never tried it before, my friends told me New Soon Huat serves good bak kut teh and its taste is akin to our neighbour’s BKT style. They even have Dry Bak Kut Teh ($7) unlike the usual soup BKT. Their Bak Kut Teh ($6) comes with enoki mushrooms, beancurd skin, pork liver and tripe. Enjoy the soup with the tender meat along with a bowl of rice for a satisfying meal. Take a break from your fast-paced life and unwind at this stretch of hushed vicinity. Take a short stroll after a meal in the area. 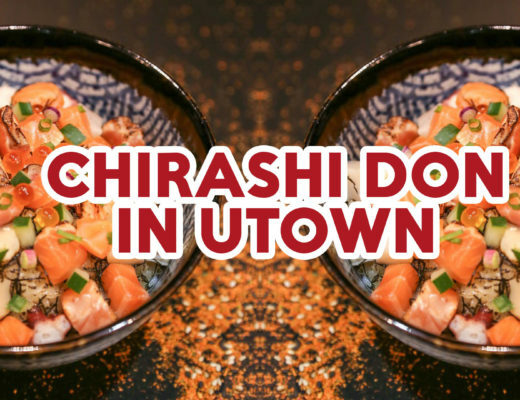 Comment down below if you know of any hidden food gems we should know of! 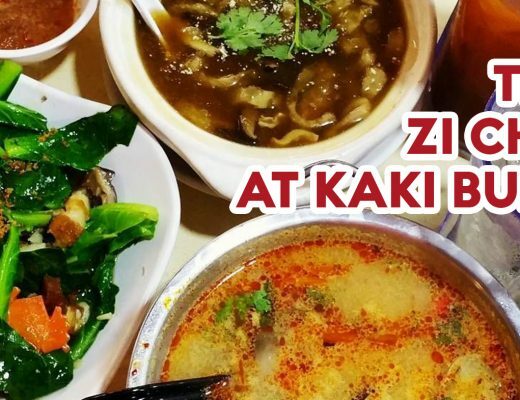 If you’re looking for more food in the area, check out these Seletar food spots as well. Featured image taken from Instagram user @memorygrids_‘s post.